We are offering our clients a wide spectrum range of Horse Haybags that are high in demand all across the world. 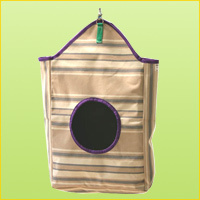 These catered by us are quite durable and perfectly stitched with strong threads. Also, we are offering customization to our clients as per their specification. Hamdam Export was established in the year 2004. We take this opportunity to introduce ourselves as the manufacturer and exporter of wide and impressive range of saddlery goods. Also we may apprise here that ever since the inception of the company our endeavor remain toward the quality and perfection of the product primary to the entire satisfaction of our customers. As a result of quality product professional services and timely delivery of the material. The most of overseas customers are satisfied quit our service. Our products are being prepared by well experienced staff. We have built our reputation throughout the years from our incredible customer service and the guaranteed product satisfaction. We have done this by committing excellence throughout the company, concentrating on honing our skills and seeking out the most advanced equipment and latest state-of-the art technology. In order to design and develop the best assortment, we prefer sophisticated manufacturing machines and equipment. Our infrastructure is backed by all required facilities along with support of highly qualified professionals. Under their right supervision, every product is manufactured keeping international standard quality norms in mind. They have complete industrial acumen that earns them the capability to offer the products exactly as per the customers' needs. Our manufactured products are sturdy in construction and have long lasting performance. Further, contribution of our team of experts has helped us in executing a quality project in the most productive and efficient manner. Our talented team of employees work in sync with our clients to understand their requirements and design cost effective and customized saddlery products.